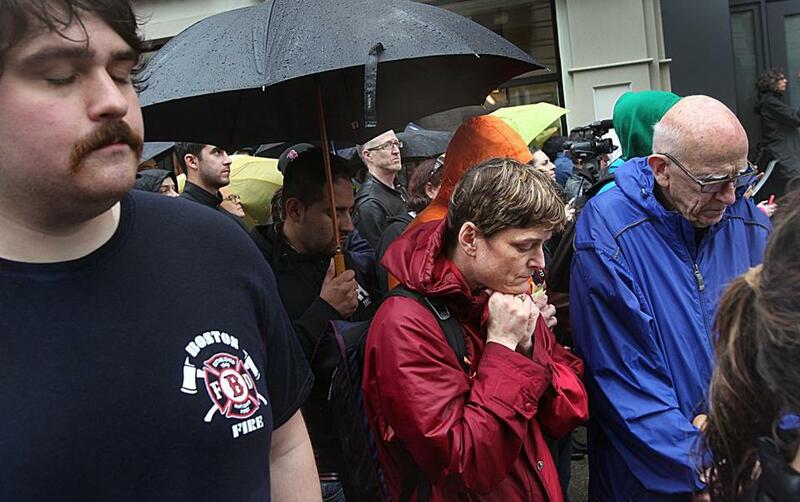 A moment of silence was observed on Boylston Street. At Faneuil Hall, tourists huddled silently in a doorway as the rain splashed down on the cobblestones. At Meetinghouse Hill in Dorchester, grade schoolers shivered in the wind, eyes raised to the tower where church bells rang. At Boston University, where Boston Marathon bombing victim Lingzi Lu had studied, the bustle of a busy student center fell to a hush. At 2:49 p.m. Tuesday, exactly one year after two bombs exploded near the Marathon finish line on Boylston Street, the city observed the occasion with a moment of silence, remembering the lives lost and irrevocably changed that April day. As church bells tolled, some people stopped in place and lowered their head in prayer. Across from the State House, Steve Rogan looked out over Boston Common. Earlier in the day, Rogan had walked down Boylston Street to the finish line. On the anniversary of the bombings, it was good to take time to remember, he said. Not far away at Faneuil Hall, Kelly McGraw stood with her family in an open doorway. She wanted to hear the bell when it tolled in the tower of the red brick Colonial landmark. McGraw and her husband came to Boston with their three children for a week’s vacation. They planned to catch a game at Fenway Park and visit the John F. Kennedy Presidential Library & Museum. They also wanted to join the city in observing a moment of silence. “We want to be able to hear the bell to honor the victims and pay tribute,” said McGraw, who lives in Oneonta, N.Y.
As the bells began to toll, a group of high school students from Quebec quieted, and passersby paused. The McGraw family stood still in the doorway, letting the sound wash over them. At South Station, about two dozen travelers gathered around the Tavern in the Square to watch a memorial ceremony on the restaurant’s televisions, creating an island of quiet reflection in the middle of the bustling station. Jeff Carboni lowered his head for the moment of silence and removed his cap for the national anthem. “It is the right thing to do for the people who died and were injured and the first responders,” he said. A year earlier, the 21-year-old was resting after completing the Marathon in a little more than three hours. This year, he hopes to run even faster. At an auditorium at Massachusetts General Hospital, employees and volunteers gathered in remembrance. At 2:49, a string trio played a nocturne by Frederic Chopin. “We hold you in our hearts,’’ the audience replied. “For all those hurt and wounded,’’ Scott read. As the string trio played, audience members clasped their hands and bowed their heads. “For all who ran toward danger,’’ Scott read. “We thank you for your courage,’’ the audience replied. Other speakers read from Scripture and prayed for peace in five different languages. Nurse Jeanette Ives Erickson called out the names of those killed in the blasts — Krystle Campbell, Martin Richard, and Lingzi Lu — and Sean Collier, the MIT police officer who was fatally shot, allegedly by the bombers. Hend Eid, a Quincy resident who attended the event, said she felt sad on the anniversary, but heartened that the city will make it through. Across the Charles River at MIT, Helen Samuels pulled open the chapel’s heavy front door, pausing in the doorway to fold up her umbrella. “I just thought this was the right place to be,” she said to no one in particular. Samuels, a retired member of the MIT staff, came to the chapel to observe the moment of silence, bowing her head just a hundred feet away from the spot where Collier was killed days after the bombings. When the appointed minute arrived, the chapel bell tolled three times, a dissonant, eerie sound that carried across campus. Outside, a dozen students stood silent. In Dorchester, the First Parish Dorchester Unitarian Universalist church tolled its 120-year-old bells for more than five minutes, as fourth-graders from the Mather Elementary School stood by. When the moment of silence passed, they rushed inside to speak with the pastor, the Rev. Arthur Lavoie, about how the attacks had affected them. One of them spoke about a family friend who lost two fingers and a leg in the attacks. Another described a loved one whose nose was burned. They all tried to understand what could make someone do such a thing. “Scripture says you have to forgive anyone who does something wrong to you,” said 10-year-old Mike Spears. “It’s never easy,” Spears replied quickly. Lavoie asked the children to pray quietly for a minute. Some shifted in their seats impatiently. But Spears bowed his head so deeply it nearly touched his knees. As he left the church, he said he had forgiven the bombers. Even after the moment of silence passed, she remained. globe.com. Follow him on Twitter @globepete.